Will four time-honored “dives” get in on downtown’s revival? There used to be more bars in Manistee, per capita, than anyplace else in the state. Or at least, that’s how the story goes. While the origins of the claim are lost to history, the fact that folks still repeat it today says a lot about how locals used to spend their Saturday nights and Sunday mornings in this Lake Michigan town. Remnants of that bygone age remain in Maxwelltown, a century-plus-old working class neighborhood nestled between Manistee’s business district and the industrial complexes that line Manistee Lake. There four old-school neighborhood bars stand within a few blocks of one another. As Manistee’s downtown experiences a rebirth, anchored by the restoration of the Vogue Theatre on River Street, the people who run those scrappy saloons hope to reinvent themselves and get noticed, too. Jeff Bladzik tends bar at the Painted Lady Saloon. He started five years ago, almost by chance, he said, because he was dating a woman who worked there. The place fit Bladzik, though. His mom grew up in a house three blocks from the bar. His dad’s childhood home was six blocks away. Now Bladzick — who has lived in Manistee his entire life minus his time in the Army during the 1980s — lives two blocks away. Last October, he became part owner of the Painted Lady, which inhabits a building constructed in the 1880s. He wants to shake things up and get the word out about Maxwelltown. He took part in Maxwelltown’s first chili cook-off in March, an event that brought hundreds of people to the neighborhood and which organizers hope to hold every year. Bladzik said he’s also been trying to figure out how to get the Michigan Department of Transportation to install a sign on US-31 that would let motorists know about the businesses in his neighborhood. He said he brought it up to a city official that Saturday night after the success of the chili cook-off but was told to forget about it; it wasn’t going to happen. Bladzik said each of Maxwelltown’s neighborhood haunts has something to offer. 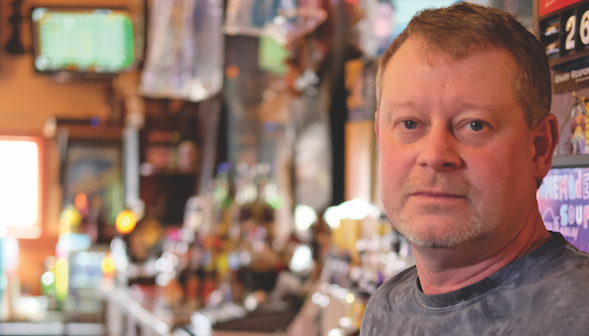 The Painted Lady is a restaurant first and a bar second — he points people who just want to hang out and have a drink to one of the other neighborhood establishments. A couple doors down, at the Hi-Way Inn, there is often a DJ or a band; a couple blocks away, at the 522 Pub, they have a large dance floor and weekend crowds. Just down the street from there is Stu’s Pub, a dimly lit bar where, on nice days, patrons can play corn hole in an attached courtyard. Bladzik said the quality of the comfort food he serves at the Painted Lady has already attracted more business. He said the Little River Casino and other hotels send customers his way. But he hopes Maxwelltown can capitalize on the momentum of what’s happening downtown, which has seen a lot of new businesses open in recent years. “This used to be loaded with businesses down here, and a lot of them have since closed,” he said. Maxwelltown wasn’t always so out of the way. Until the late 1950s, US-31 wound its way through the neighborhood on its way toward downtown before the highway stretched north. Back then, the road was lined with businesses that catered to travelers and to the neighborhood. The name Maxwelltown comes from a lumber baron who came to Manistee in the 1860s. John C. Maxwell owned a lumber mill on Manistee Lake. The Maxwell & Pundt mill opened in 1868, according to an 1882 history of Manistee and surrounding counties. Maxwell left Manistee not long after and was not heard from again. But his name lived on. “He was only in Manistee for maybe eight to 10 years, but he bought up most of the property in that area, and the name Maxwelltown stuck. It’s been known as that ever since,” Fedder said. From its beginnings, Maxwelltown has been a solidly working-class neighborhood of modest houses on a tight grid of streets. The easternmost streets form a staircase of blocks that fall diagonally south along the shore of Manistee Lake. Once all of the trees that could be reached from the Manistee River were cut, Manistee needed to reinvent itself, and it did in the 1920s when it became an industrial town. That pivot was a success for decades but began to slow down in the 1980s, Fedder said, when a lot of industries closed or moved elsewhere, including the Century Boat Company, Manistee Drop Forge, Ex-Cell-O, and Glen of Michigan, a garment factory. For Maxwelltown businesses, things started to slow in the 1950s when the highway was moved, but business was really hurt when most of the blue-collar jobs vanished. Today, Morton Salt, Packaging Corporation of American, and Martin Marietta are the only old industries that remain, but even those employ only a fraction of the number of workers they did a few decades ago. What’s next for Maxwelltown? Fedder isn’t sure. Maybe Maxwelltown, like River Street, can reinvent itself again and become a tourist destination. “It would be great to think that area of town, Manistee in general, is going to see a lot more activity,” he said. The four bars that remain weren’t always watering holes. Stu’s Pub, for instance, is in a building that used to be a slaughterhouse. There are still hooks and a winch in the back room. The Painted Lady, which today looks like an ornate turn-of-the-century saloon, was once a pharmacy, Fedder said. Still, those four bars that remain have been bars for as long as anyone can remember. Fedder, who was born and raised in Manistee, said that in his mind, Maxwelltown hasn’t changed much over the years. While Maxwelltown hasn’t seen much change in years, Manistee’s downtown district has seen a small transformation of late. Fedder said he is often skeptical when he hears about big changes coming to Manistee, but the Vogue project proved him wrong. Fedder worked at the theater before it closed, years before its restoration. He said he was doubtful when plans to revive the venue were announced, because over the years a lot of grand projects were talked about and never went anywhere. Today, from his vantage point at the history museum, just down River Street, he said there is a rebirth taking place, gradually, in the downtown district. Something does seem to be happening around River Street. The most recent addition is the North Channel Brewing Company, which opened late last year just north of the main street. It’s a smartly designed craft brewery and restaurant located in an historic repurposed building near the river and the Maple Street drawbridge. The bluefish kitchen + bar, an upscale American restaurant, opened just down River Street from the theater in 2013. The venture was announced as an investment that was inspired by the Vogue. TJ’s Pub and the Ramsdell Inn reopened a few years prior to the Vogue renovation in the Ramsdell Building at the corner of River and Maple streets. The former bank building now includes a 10-room inn on the upper floors, a special events space in the original bank lobby, and a pub and restaurant in the lower level. Those are just the most visible new additions to Manistee. Tyler Leppanen, executive and economic development director of the Manistee Downtown Development Authority, said more than 20 successful new businesses have opened in the past five years. Just this month, an art gallery, a convenience store specializing in selection called the Manistee Beverage Company, a bridal store, and a bike and moped rental business are opening. Leppanen said he hopes that success can pour over into Maxwelltown, which is not part of the DDA. Cecelia Van Alstine opened Two Slices, a restaurant that sits between the Painted Lady and the Hi-Way, last August. She picked the spot because it was one of the few commercial kitchens available in Manistee, but she likes the vibe of her new neighborhood. Van Alstine, an artist who grew up in Manistee and gradually got drawn into the culinary world, said she doesn’t like to use the word “gentrification,” but she thinks Maxwelltown might be ripe for it, and she sees signs that it is happening. She also hesitantly uses the word “dive” when talking about the neighboring bars, but she uses it with love. You might call any of the Maxwelltown bars “dives,” after all, but Van Alstine said she hopes that if gentrification does come, and the neighborhood is transformed, that some of that original character is preserved. Kari Warren, manager of the Hi-Way Bar, believes that Maxwelltown can attract new people by offering a different atmosphere than River Street. “I think there’s got to be something done, because downtown, they get all the tourists,” she said. The bars of Maxwelltown, after all, are old-school neighborhood places that should have an appeal exactly because they are not multi-million-dollar, professionally designed craft breweries or restaurants. Warren notes that the bars of Maxwelltown have pool tables, corn hole, darts, and Keno, unlike the places downtown.